Police in New Jersey have released a video showing two police officers shooting a black man dead after he tried to get out of his car with his hands up. The incident happened on December 30, but the recording has only just been made available. 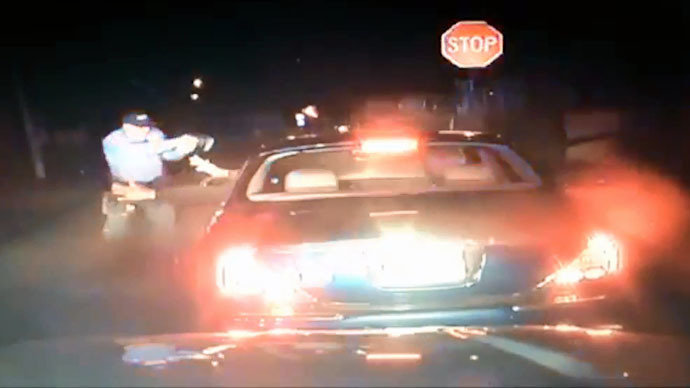 The video shows two New Jersey cops in Bridgeton pulling over a black sedan. Initially nothing seemed to be a problem as the officers, Braheme Days and Roger Worley asked the driver Leroy Tutt, 46,to show them his drivers license. Tutt who had been traveling with a passenger, 36-year-old Jerame Reid– also sitting up front – had been told that he had been pulled over because he had failed to halt at a stop sign. However, the situation began to escalate as they officers changed their tune and shouted at Tutt and the Reid to show them their hands. The driver’s left hand can visibly be seen out of the window. The police told the driver and the passenger to stay still or they would kill them if they moved. Despite having both his hands outside of the window, officer Worley and Days opened fire and killed Reid, firing nine bullets in the process. The driver later got out of the car and was arrested by police officers, with back-up quickly arriving on the scene. Both police officers, Days, who is black and Worley, who is white have been placed on administrative leave. This is the latest of a series of shootings that has been caught on a dashcam. Last week Montana police released a graphic video of a Billings police officer sobbing after killing an unarmed man who was high on methamphetamine last April. The jury in a coroner’s inquest found the officer was justified in the shooting. Billings Police Officer Grant Morrison killed Richard Ramirez, 38, in April 2014 after he thought he saw Ramirez reach for a gun. The victim was high on methamphetamine and riding in the backseat of a red sedan. The footage of their interaction and Morrison’s subsequent reaction was captured on the police car’s dashboard-mounted camera. The Yellowstone County Attorney is not expected to file any charges after the jury's decision. However, the Ramirez family said they intended to file a lawsuit accusing Morrison and the Billings Police Department of racial profiling against the half-Mexican man, the Associated Press reported. Under Montana law, coroner’s inquests are required for officer-involved shooting deaths or when someone dies in custody.